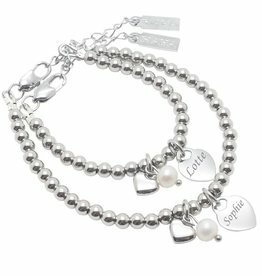 Silver Mother and Daughter Bracelets, for your Special Moments. 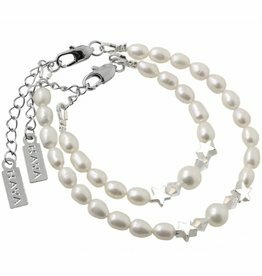 For your special moments, KAYA has made a collection of silver bracelets for you and your daughter to wear in your special occasions. These bracelets are suitable for occasions like birth, baptism, jewelry for the bride and bridesmaid, communion, as well as all other special celebrations. Because all of our jewelry are made of the finest freshwater pearls, gems, and crystals, you and your girl are going to shine together! “Keeping memories alive” this is what Tanja Rakhou, KAYA’s founder, was thinking of when she designed birth jewelry collection for mothers and daughters. “The reaction was fantastic, all my friends ordered a set for themselves and their mini-me” says Tanja. Just imagine how sweet and symbolic is this, mothers and daughters wearing the same jewelry piece while taking pictures in special memories. This will really keep memories alive and will make you think later how small your daughter was. The bestseller piece of the Mom & Me collection is the “key to my heart” collection. The captivating charms which are inspired by the 19th century keys that provided access to secret gardens, these are self-explanatory charms. At the baby bracelet, a key is attached, this key opens the clasp attached to the mother’s bracelet! So, your baby will forever wear the key to your heart, can you imagine how sweet is this? Because of the special sweet meaning of this collection of jewelry, I usually receive lots of request for 2 parts of ladies necklaces. You can order this for no extra cost! 1- Choose the length of your daughter’s necklace. How special, a charm with a personal message for mom and daughter. Made of bright white pearls, white Swarovski crystals and silver flowers. Personal gift! How special, a mother daughter set with charms that say 'love you always. " Applicable for the unconditional moerder daughter bond. Made of bright white pearls, white Swarovski crystals and silver flowers. These bracelets are true ceremonial pieces: Glittering AAA quality ivory pearls, Swarovski crystals and sweet rings. Getting Mom bracelet is the heart previous lock which the little girl holds the key, how sweet is that! These bracelets are true ceremonial pieces: Glittering AAA quality ivory pearls, Swarovski crystals and sweet rings. Depends on both bracelets sphere center. Quite the same as mama, how sweet is that! These bracelets are true ceremonial pieces: Glistening ivory white shell beads, white and silver Swarovski kristalelen stars sparkle towards you. Beautiful by its simplicity. what will you shine together! These bracelets are true ceremonial pieces: Glistening ivory white shell beads, white Swarovski crystals and silver stars sparkle towards you. Beautiful bracelets made of shiny AAA-quality powder pink gems, twinkling light pink crystal and silver rings. 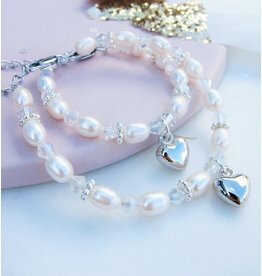 Hang on the bracelets, two silver-plated convex hearts, symbolic of the mother-daughter bond! 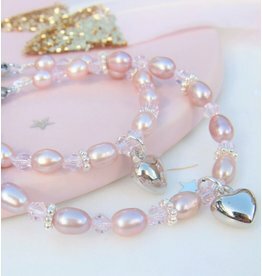 Beautiful bracelets made of shiny AAA quality powder pink pearls, twinkelend light pink crystal and silver rings. At the mom bracelet is a clasp that your daughter has the key, the Key to Your Heart! These bracelets are true ceremonial pieces: Glittering ivory pearls, Swarovski crystals and white sweet flowers. Perfect with a white dress. Mamma her bracelet is a clasp, your daughter has the key to your heart, how sweet is that? These bracelets are true ceremonial pieces: Glistening ivory pearls, Swarovski crystals and white sweet flowers. Perfect with a white dress. To your bracelet hanging butterfly, symbol of freedom and happiness. These bracelets are true ceremonial pieces: Glittering ivory pearls, Swarovski crystals and white sweet flowers. Perfect with a white dress. Depends on both bracelets sphere center. Quite the same as mama, how sweet is that! 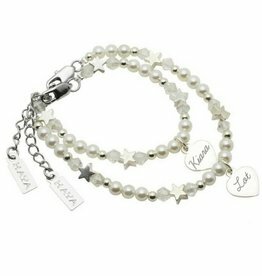 This bracelet says to the little girl, "You are my little star '. You carry symbolic convex hearts, symbolic of your special bond. Made of freshwater pearls, mother of pearl and Swarovski crystal star. These bracelets are true ceremonial pieces: Glistening AAA grade ivory white pearls, Swarovski crystals and sweet rings. On the double bracelets hang two convex hearts symbolize your special bond.